Facebook post written by Anne Potter on 6/6/16. I would like to tell you about an amazing little family. 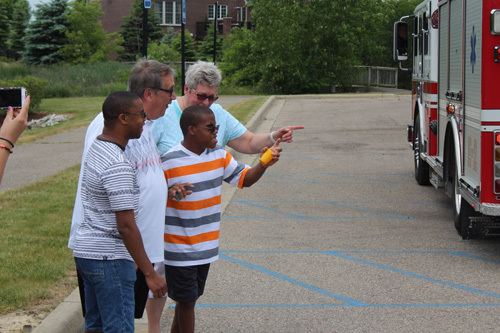 About 23 years ago a family from the western suburbs of Detroit adopted infant triplets. They were two days old, and addicted to crack. In addition, they all three had significant health issues and birth defects, including asthma, seizure disorders, heart conditions, and skin conditions; and all three were on the autism spectrum. 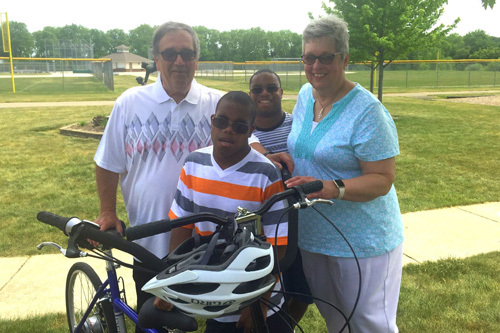 Adopted at birth, Tony, Ben, and Cari were blessed to be welcomed into a loving family and home, which included two other birth children already in high school. As an infant, Tony needed open heart surgery. And then as recently as a year ago, Tony had a second heart surgery. He is, in terms of the three siblings, the most highly functioning on the autism scale, and I can assure you, quick with his wit. They were told that Ben, who was paralyzed on half of his body at birth, would never walk. As his dad would now say, they were correct. He never walks. He only runs. Ben is, by comparison, the most effected by autism of the three, and mostly non-verbal. Cari was completely sightless in one eye, and legally blind in the other. Even with such limited sight, Cari loved birds, and was especially fond of the Red Tailed Hawk. In 2007, at the age of 13, their daughter Cari unexpectedly passed away of an asthma episode. Today the boys, Tony and Ben, are 22 years old and are inseparable adventure buddies. They enjoy kayaking, volunteering at a local theater, and swimming and hiking together. 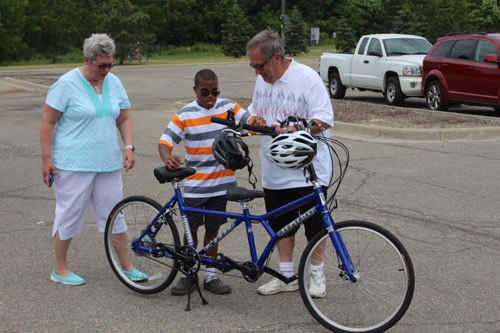 This winter the family entered Ben into a contest to win a specially adapted bike: a tandem bicycle called a "Buddy Bike". 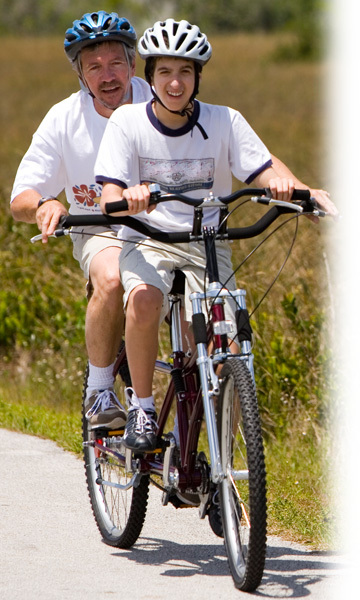 The family had tried using a traditional tandem bike in the past, but Ben would just jump off the back of the bike when they came to a stop, and they could not monitor what he was doing. 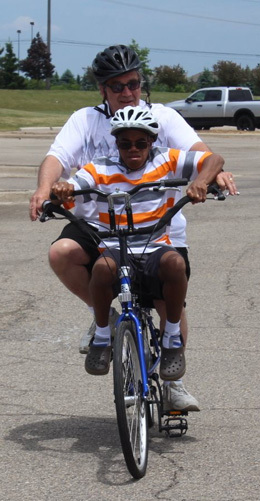 The Buddy Bike allows for the 'stoker', the rider, to sit in the front, while the captain sits in the back. It is quite an unusual bike, but excellent for this type of situation, where the stoker gets the full experience of riding a bike: being able to see the view, feel the wind in his face, and "help" to steer. It is a completely different tandem experience. 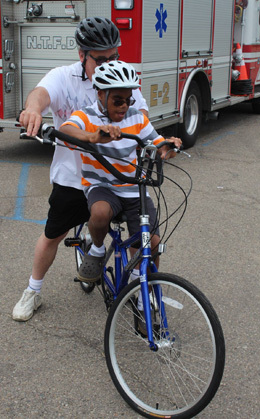 While Ben got lots and lots of votes in the contest, he unfortunately did not win the Buddy Bike. It was at that point that I just decided, there is no reason why we can't raise the money to purchase this bike for Ben! His dad was a beloved high school teacher of mine. For that matter, he was a beloved teacher for many, many, many former students of Northville High School in Michigan. He taught English, creative writing, drama, and was the theatre director. He retired just last year after 46 years in the same high school he attended himself. It is safe to say, he touched several thousands of young lives in those 46 years. I'm sure you know someone just like him… your very favorite high school teacher. So, no problem raising funds, right? Absolutely! 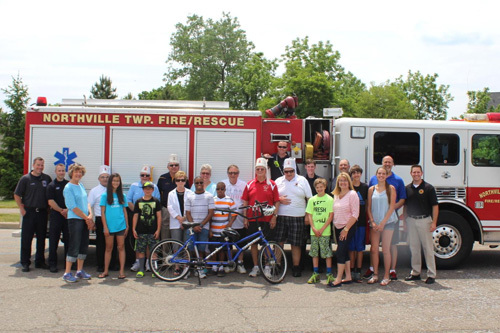 Through social media and online fundraising, we were able to raise over $2,600 in two months, in order to purchase this bike. 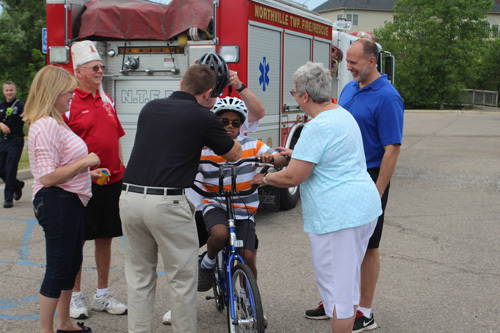 Former students made generous contributions, as well as the Northville Township Fire Fighter's Charity Fund, and a sizable donation from the Manresa Caravan of the Order of the Alhambra (a service organization specifically for kids with disabilities) in Northville. We also had hundreds of people who liked and shared our posts on social media and helped to get the word out. There were lots and lots of hands that played a role in making this happen. On this past Saturday, June 4th we did a big reveal party! Many people who had been part of the fundraising came to celebrate, and many more former students and friends were there in spirit. The fire fighters brought one of their engines, and on the count of three we all yelled, "MOVE THAT FIRE TRUCK!" to reveal a gleaming Buddy Bike behind it. These pictures show the priceless reactions from Ben and Tony, and the bike riding that came after. At that party, Ben's mom brought colorful t-shirts for all of us to sign for the boys. One said 'Captain' (for Tony, who will be in the captain's seat), and the other says 'Stoker' (for Ben, who will be adding the locomotion by pedaling). According to Ben's mom and dad, this morning Ben refused to wear the shirt that his mom had laid out for him for school. Instead, he dug through his drawer to find his 'Stoker' t-shirt. Then he grabbed his dad's hand, and took him out for a ride around the block before the school bus arrived. This afternoon, his brother Tony started learning how to captain the bike. So, there you go. What can we learn from these two young men, and this amazing family? Well, I guess we can all learn that even though it's great to be a captain, being a stoker can be just as exciting. We can all bring happiness to people around us, no matter our skills and abilities. If our hearts are opened to it, we can all experience the excitement of a very special t-shirt, and the pleasure of taking an early morning bike ride. If we just slow down we will realize, there is so very, very much in life to appreciate. And if we take a risk, and we reach out on faith, we just may be blessed with something so unexpected, like maybe, a special set of siblings who teach us about the wonders and joy of life.